Good deed means good, beautiful and beneficial act, and to act in accordance with Allahs content and pleasure. There are a lot of verses in which good deeds are mentioned immediately after faith, in the Holy Quran. This is guidance and drawing attention. It is a divine warning to men, who believe in Allah, to support his belief with consciousness of adoration and acts of worship. It is very important that the deed should be good. The most important condition for the deed to be good is sincerity, that is to say, to expect only Allahs pleasure as a result of that act, prayer or favor, and not to look after another benefit. The author of Nur (Badiuzzaman Said Nursi) compares the acts without sincerity to soulless beings, to statues by saying, sincerity is the spirit of good deeds. Even if we gather hundreds of human statues in a place, they will not be equal to one living individual because they do not have life and spirit. All of the prayers performed for hypocrisy, material benefits or gaining appreciation are included in this group. However, the body also has an importance apart from the spirit. 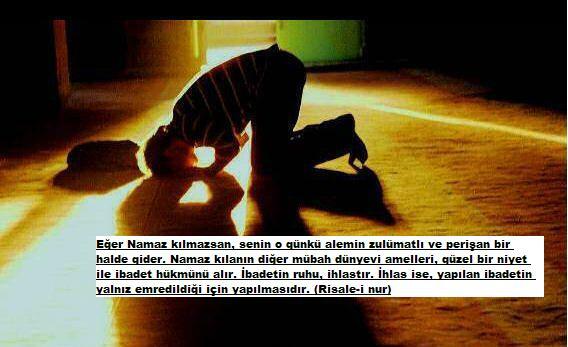 The form acts as the body in a sincere prayer. The Maghrib (evening) prayer is three rakats and if this prayer is performed as four rakats, this act becomes invalid in terms of form. Assume that that four-rakat prayer becomes embodied, nobody would say it is Maghrib prayer. Similarly the formal condition of the fasting of Ramadan starts before the sun rise and ends after sunset. It cannot be called fasting if it starts after sunrise and ends after nightfall. In terms of form, that fasting is something different. Therefore, the format condition of prayers must be taken into consideration and prayers must be performed in the style which Allah is pleased with. An individual could be absolved from responsibility when he fulfills the format conditions of prayers. However, prosperity and spiritual perfection gained from that prayer is compared to the sincerity, which is the spirit of prayers. Not to infringe on material and immaterial rights of people is included in the definition of good deed. At first sight, this definition may be assumed to mean taqwâ but when it is considered that there is a strong relation between taqwâ and good deeds, it is understood that this definition is also valid for good deed. A life, which is spent without infringing on both material and immaterial rights of people, is a good life. Avoiding is taqwâ; telling the truth is good deed. Regarding the absence of worshipping as wrong is taqwâ; worshipping is good deed. People are the slaves of Allah. It is obvious that God is not pleased with infringing on peoples rights. Our Lord does not approve of tyrannizing unbelievers, either. Then, avoiding from hurting Gods slaves, slandering, smearing, begrudging and killing them are included in the definition of good deed. When the term Allahs rights is used, mostly individuals faith and prayer life is understood. A person who has a wrong creed infringes on Gods rights ; similarly a person who does not live in accordance with his belief and does not obey Gods commands infringes on Gods rights too.